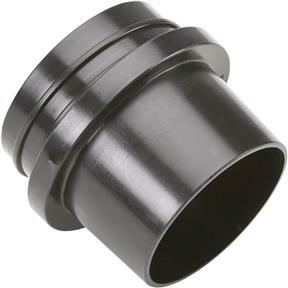 This 4" Quick Coupler features a 4" OD tapered male end and a 4" OD threaded end that fits 4" flexible hose. Ideal for quick connection to 4" machine dust ports. This is an excellant product. It fits the 4" flex hose perfectly and the male end fits into 4" scd. 40 pvc perfectly. Makes a good seal for my dc. It didnt fit a standard 4" coupler. When I ordered it I thought it should have been the correct fitting.